ElectricQuakes is loading lots of data! Please wait at least 30 seconds! Please consider supporting my Patreon. This site is free and has been since the early 2006! There is now a quick 5 minute VIDEO ElectricQuakes daily earthquake report on youtube as you see above! Click here to see the latest report and please subcribe! 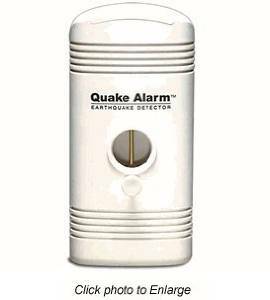 Buy an Earthquake Warning alarm! Top selling music this hour! *Click here to Email us. The FIRST website to explore the interaction between earthquakes, electrical phenomenon and solar wind. "ElectricQuakes.com was the first in the field and on the internet since Feb 2006. Long before Dutchsinse, before Suspicious0bservers, (before Youtube!) there was Electricquakes.com . 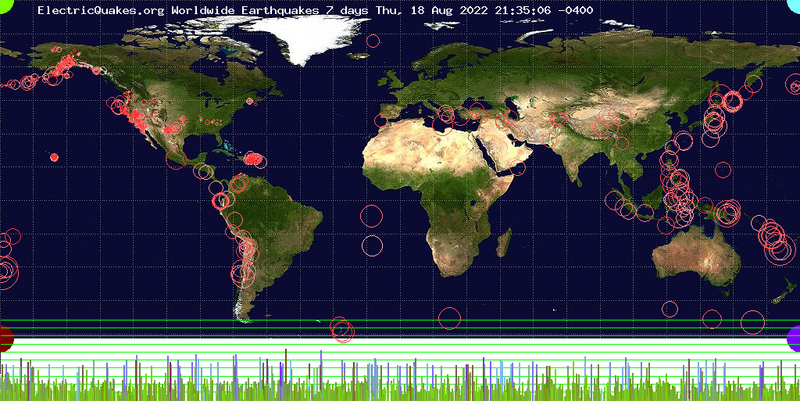 All such sites are virtual copies of the original electricquakes.com from 2006 which identified and documented visually with live data feeds all major phenomenon now touted as new discoveries by others today https://web.archive.org/web/20060212092057/http://www.electricquakes.com/ . " Scroll down to see if there was an earthquake. Recent Earthquakes in California/Nevada Earthquakes. Recent Earthquakes in Los Angeles Area. Recent Earthquakes in San Francisco area. Recent Earthquakes in Long Valley Area. All the images below are LIVE data which will be explained further down the page! Webpage Latest Updates! Earthquake early warning device! Earthquake early warning device invented! To read more about my experience with this excellent device click HERE. Click here to get your earthquake alarm seismograph warning system. To those not familiar with the well documented, peer reviewed and published, and NASA and NOAA satellite monitored scientifically reviewed principals behind the planetary /sun/ earth interaction let me bring you up to speed. Quite a few studies link increased probability of earthquakes with increased solar flare/flux output. The mechanism is believed to be extra heating of the ionosphere raising and lowering the atmospheric height. Here is a photo from NASA of the ionosphere glowing with energy from the solar wind creating what we call the Northern Lights. expanding or shrinking the ionosphere changes the angular momentum of the earth and thus slows or quickens it's spin. 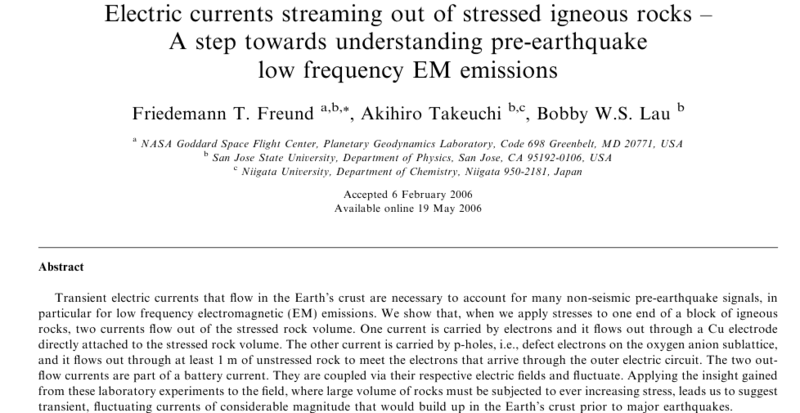 This subjects already stressed earthquake faults to sharp jolts that may trigger an earthquake. The US Naval Observatory measures and graphs these daily spin changes (more about that further down the page). Other possibilities including static discharges related to atmospheric moisture content. Large precursor electrical signals have been detected before many earthquakes including famously before the World Series earthquake in San Francisco. The origin of those signals is not known but peer reviewed studies in some cases ruled out ground sources but specifically excluded off ground sources from the data set. Earthquake faults heating up from new stresses can be detected on infra-red satellites now and unusual fault heating along with ions over the fault can under the right atmospheric conditions also cause moisture to rise from the earth at the fault which can condense to form a high altitude "earthquake cloud" that sometimes points like campfire smoke to the fault about to rupture. This was specifically seen on satellite above Iran before a quake ( ). It is also possible to detect changes in the electrical field over the ground in space near earthquake faults under stress and we are working on delivering data sources of that to you. Until recently the French Demeter satellite did this, but they did not share their data and the satellite was turned of March 17, 2011. 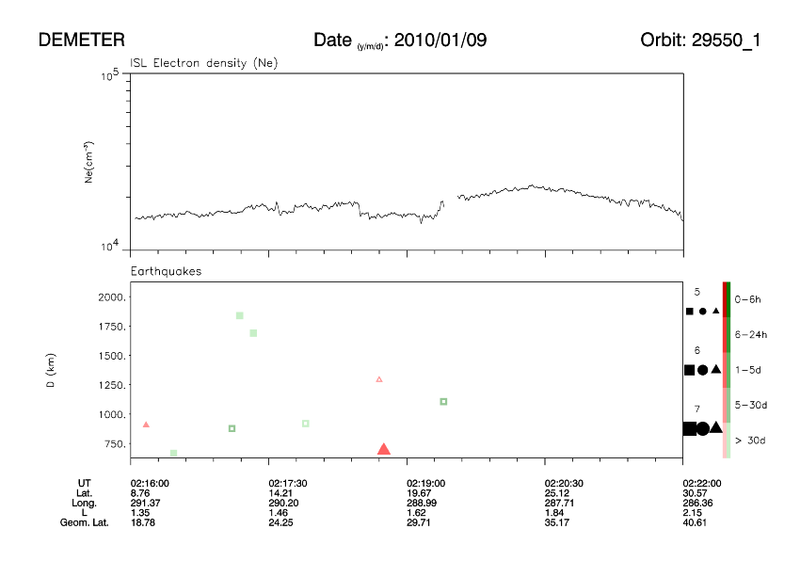 It however detected clearly ionospheric electrical activity as a decrease in electron density above Haiti three days before the mag 7 earthquake on January 12, 2010. It also observed an increase in the densities and a decrease in the temperature which were well localized above the future epicenter in Samoa seven days before that earthquake on September 29, 2009. "(Fig. 3) This chart shows the accuracy of the BroJon Calculator for the last half year. The predictions showed that the highest probability observed in the past several decades occurred on Dec 26, 2004, when the moon was full and on the same day was at highest declination extension, along with the sun at opposition and at lowest winter declination on Dec 21. The computer model also predicted the dates of the largest earthquakes for each of the succeding months within several days. This is the same program used to make Fig. 1 above." The goal of this website since it's premier years ago has always been to education people about these hypothesis's and to present far ranging LIVE DATA so amateurs and professional researchers can look at the data for correlations themselves. NOTHING makes an implausible connection more real than seeing the source data graphed live by a respected institution like NASA. The live data is further down the page. Sponsor message - Prepare yourself! The Bug Out Bag Book: How To Create An Emergency Gear Bag. 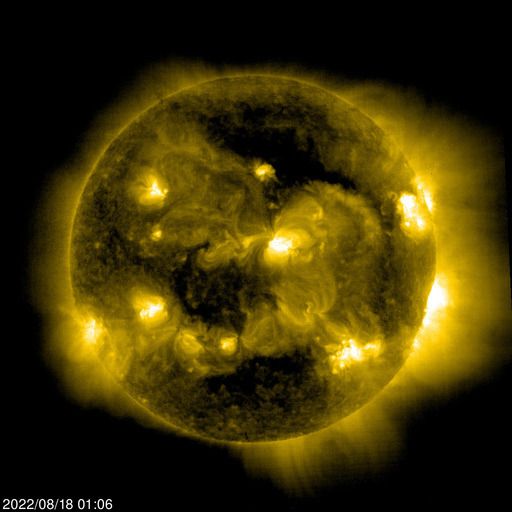 - as you can see from these live movies from the NASA SOHO satellite - which is looking at the sun right now - the sun is constantly in flux and giant explosions on its surface hurl variable amounts of electric protons (solar wind) our way. These are variations in solar wind. The NASA POES satellites in polar orbit right now measure the energy in the solar wind several times a day when crossing the earth poles. This graph shows variations in solar wind Magnetic Field & Solar Wind Electron Proton Alpha Monitor (SWEPAM) over the past 24hrs as measured by the POES satellites. This one shows variations in solar wind Low Energy Electrons & Protons - Electron Proton Alpha Monitor (EPAM)over the past 24hrs as measured by the POES satellites. This one shows magnetic variations in solar wind Magnetic Field & Solar Wind Electron Proton Alpha Monitor (SWEPAM) over the past 7 days as measured by the POES satellites. This one shows variations in solar wind Low Energy Electrons & Protons - Electron Proton Alpha Monitor (EPAM)over the past 7 days as measured by the POES satellites. On the bottom of the image below do you see earthquake frequency that coincides with the data above from the past 7 days? LIVE IMAGE! California/Nevada Earthquakes from the past week show up in this image. This Geomagnetic sensor in Fresno, California show changes in earth's magnetic field near Fresno California. Do any earthquakes above seem to coincide? LIVE IMAGE! Geomagnetic readings from Fresno today show up here. Many scientists have speculated that faults may be more likely to release when the faults in Southern California feel strong ocean tidal forces from the moon. Current California Tidal Forces show up here. Some things might affect faults anywhere in the world so here is the activity all over the United States. The following revolutionary image is a real time model of the ionospheric ion density over the world. It changes rapidly (roughly every hour) but with major earthquakes one sometimes finds an ionospheric hotspot in the vicinity. Theories are that squeezed earth faults cause peizoelectric rocks like quartz to create ionic charges near earth's surface or perhaps even solar wind hitting earth triggers quakes and that wind can perhaps be detected by the way it ionizes the atmosphere. For the first time in the world this data can be studied live next to a matching map of worldwide earthquakes. UPDATING AGAIN! Can you match any of the above activity with earthquake occurrences in the world? The USGS USED TO display the statistical probability of a Magnitude 6 AFTERSHOCK in California based solely on the amount of other recent earthquake activity. (Every earthquake has a statistical risk of triggering another earthquake including a larger earthquake. This image did NOT factor in any other risks or indicators.) Unfortunately they no longer provide this data. Most people are surprised to learn that the earth does not actually rotate at the same speed everyday. One reason is because when the earth's atmosphere is hit with strong solar winds the atmosphere expands higher. (A recent 2008 study found high correlation with a five year time lag (!) between solar activity and earth spin changes http://www.springerlink.com/content/d71wm65u6v162348/ ) When that happens the earth actually turns more slowly, just as a spinning ice skater slows down when stretching out her arms. This spin change in earth's rotation has been measured for decades by astronomers, and the US NAVAL Observatory creates this graph of the changes in the "Length of DAY" (LOD) all the time. This variation affects astronomical observations (when a star will exactly cross a point in the sky in front of a telescope) and other things so it is important to track. We can look at this graph and see if sudden slow downs or speed ups in earth's rotation "jolt" earthquake faults and cause more earthquakes around that time. My hypothesis is that certain faults lined up in certain directions will be more likely to be affected because those fault's stress forces line up with the changes in stress caused by earth spin changes. If that wasn't enough the earth's poles (the center of rotation) also move around! The US Naval Observatory plots those changes too! The Navy actually plots the changesinthe motion of the earth compared to the changes in the atmosphere now. Comparison Plots of Earth Orientation Variations and Atmospheric Excitation: Variations in the distribution and flow of the Earth's fluid constituents are thought to be responsible for the observed variations in the Earth's polar motion and rate of rotation (UT1). This reflects the physical principle of conservation of angular momentum for the whole-Earth system, including both the solid and fluid parts. The plots below compare the geodetically observed EOP variations (Green and Blue lines)with the expected effects due to the atmosphere (red lines). While the atmosphere is only one of the geophysical fluids responsible for EOP variations, it is the most important and most accurately observed. The atmosphere data used here are produced by the National Centers for Environmental Prediction (NCEP) as a byproduct of their meteorological assimilation models. Two time series of geodetic observations are shown for comparison -- the Bulletin A combination (Blue Line) and the IGS Final series based on GPS data only (Green Line). Clearly the correlation is nearly exact! We can see the solar wind hit the Earth's "magnetopause" with the ACE spacecraft. We can also see the solar wind hit the Earth's "magnetopause" (the big magnetic cloud of protons and electrons surrounding the earth because of earth's magnetic field). We have a spacecraft called ACE that watches that impact all the time. In the image below the dot in the center right is the earth. The wake that looks like the waves on the front of a boat is the "front" of the Earth's Magnetosphere being pummelled by the solar wind. The sun would be WAY off to the left of the image "blowing" toward earth and buffeting the Earth's electronic "atmosphere" of protons and electrons. This changing solar wind that is deforming the Earth's "electric cloud" is a huge amount of force. Routinely it is in the 8 to 12 GIGAWATT range. Yes that's GIGAWATTS. A gigawatt is 1000 times a mega watt. The San Onofre Nuclear power plant only generates 2 Gigawatts. When this force hits the earth it tends to head in at the poles and this lights up huge parts of the earth's sky known as the northern lights. Yes, it's that strong and more. 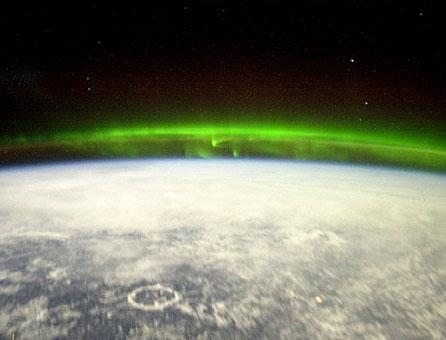 This satellite watches the Aurora and estimates where the northern lights will be. When the solar wind is very strong the Aurora or "northern lights" can be seen all the way south to California. That is FAR more power than exerted by many influences on the earth and plenty to exert physically phenomenon such as spin changes and earth electrical interactions. (in fact the 1989 Canadian power blackout was traced directly to a solar flare) . *288.9 GIGAWATTS folks that is a real shot across the earth's bow. typically one effect is northern lights can be seen in middle California during these events. So you can see the Earth is really getting hit by big variations everyday. Don't forget that the earth ALREADY has huge amounts of electric power running through the earth below your feet. Giant currents flow through the earth which you don't feel because they don't go through you. These are called Telluric Currents. People searching for oil use them in a process called Magnetotellurics to find strata in the earth. The currents are induced in earth by changes in the ionosphere around earth which is caused by the ionosphere being hit by the solar wind. When huge fluctuations come from the Solar wind and they compress the magnetosphere around earth this can radically change those currents and induce voltages and currents in powerlines. That can cause BIG electrical blackouts over huge areas. The Solar wind and Space Weather is so important to so many things such as satellites and radio communications that the US government has a website to monitor it and issue warnings. www.sec.noaa.gov directly monitors solar output and warns of it's impact on the upper atmosphere and the earth every hour. 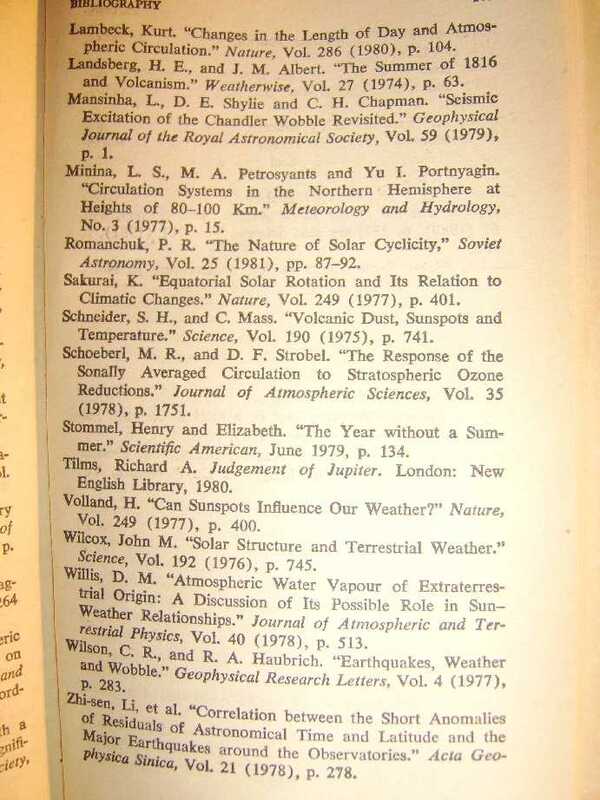 Also read http://science.nasa.gov/headlines/y2003/23oct_superstorm.htm which discusses the 1859 super storm and the 1989 flare storm which took out the Canadian Power grid. The long and the short of this is that there are HUGE electrical forces hitting the earth which affect it's spin, charge , atmosphere and it's faults. 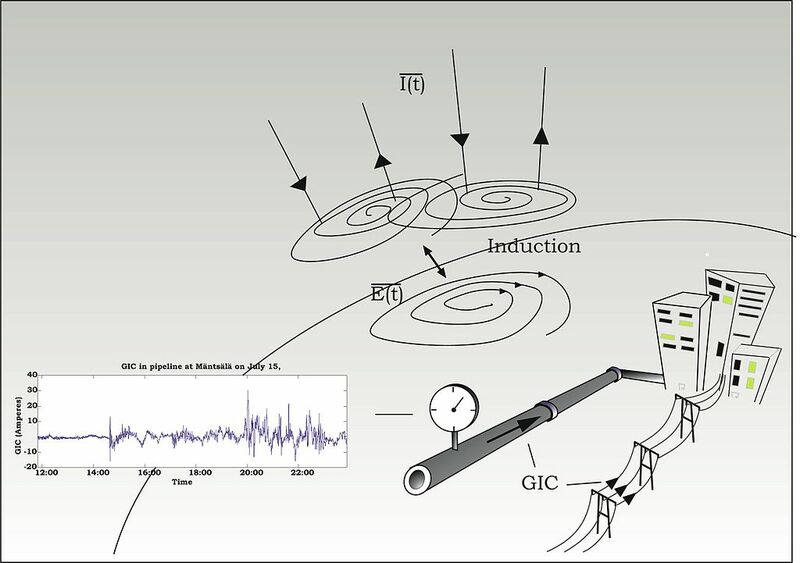 Therefore there may be correlations between when earthquakes are triggered and many of these sensors. Many scientists have studied these forces as peered reviewed contributors to the Journal of Geophysical Research. I quote "To research the "perfect space storm" of 1859, Tsurutani and co-writers Walter Gonzalez, of the Brazilian National Space Institute, and Gurbax Lakhina and Sobhana Alex, of the India Institute of Geomagnetism, used previously reported ground, solar and auroral observations, and recently re-discovered ground-based magnetic- field data from Colaba Observatory in India. 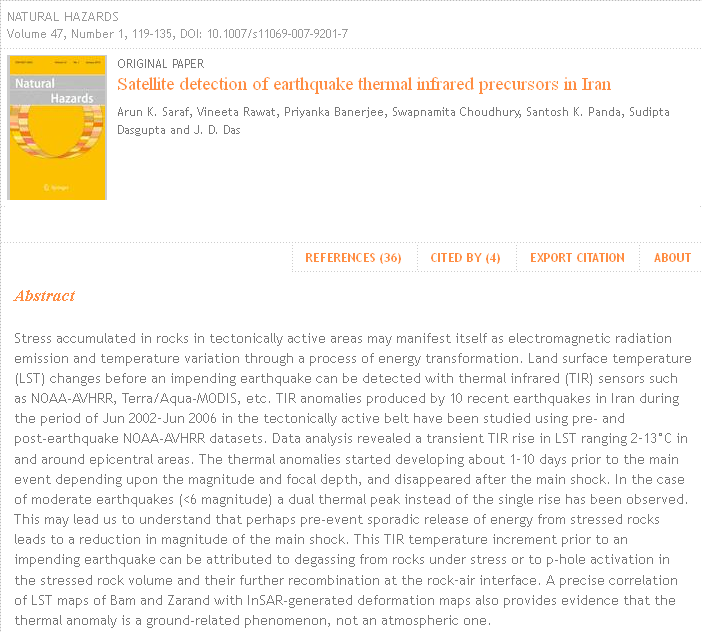 The findings were published in a recent issue of the Journal of Geophysical Research."" So how can we predict when the Sun will hit us with big solar winds that might trigger stressed earthquake faults to create an earthquake at that time? Here's where it gets REALLY interesting. Did you know those 200 variable solar wind GIGAWATT were directly influenced by the positions of the planets. Yes. They really were. "How can that be?" You might say. "That sounds like nonsense!" In fact as any astronomer will tell you, the whole solar system does not revolve around the sun like you were taught in grade school. Actually it all -including the sun- revolves around the center of gravity of the WHOLE solar SYSTEM called the Barycenter. The position of Jupiter - because it is SO big even though it is far from the Sun- is also one of the primary determiners of the position of the barycenter. Consider the barycenter as the center of the teeter totter and Jupiter is the fat kid sitting way out at the end of the long plank. He can really tilt everything a lot. Two bodies with a slight difference in mass orbiting around a common barycenter. Two bodies with a major difference in mass orbiting around a common barycenter. Two bodies with an extreme difference in mass orbiting around a common barycenter. The position of the solar system's center of gravity or Barycenter is computed in Ephemera by astronomers every day. Astronomers calculate where the planets will be many years in the future and for 100's of years in the past. it's easy using computers because the planets follow predictable paths based on gravity and orbits. So the location of the center of gravity of the whole solar system barycenter is known in the future because it is determined by the all planet's orbital positions which can be precisely calculated as well 100's of years in past and present . Occasionally when the planets align in certain ways the barycenter can pass right through the sun itself. This is a bit like your dog occasionally walking right through your body. As you can imagine that could possibly effect your circulation patterns and that is what happens with the sun. Remember the Sun is not solid. It is very fluid like with internal circulation patterns that can easily get disturbed just like you can spoil a whirlpool in a drain with just the tip of your little finger. When the sun's circulation patterns are affected, solar flares and periods of high solar activity can result. Even when the barycenter just nudges the edge of sun it can really mess with it. And Mercury is close enough to toy with the sun all by itself. Mercury despite it's small size has the greatest measured effect on the sun because of how close it is to the Sun. Venus and Jupiter are next in line because of Venus's close proximity and Jupiter's huge size respectively. So you see there ARE big direct scientifically measurable effects of other planets on the earth because of their positions affecting the sun which directly affects us in a huge way. The sun like a water hose nozzle and the planets can squeeze that nozzle and greatly effect the jets of Solar wind that hit earth. So don't be quite so quick to scoff at the possible physical influence of the planets and the sun on the earth (and therefore possibly on earthquake timing). The planetary/solar effect on earth is real and measured by NASA EVERY SINGLE DAY. and variations in the sun's Sunspots have been measured for over 400 yrs. So we now know that gravity is by no means the greatest force exerted on the planet earth by other planets. So Carl Sagan's famous quote about "the nurses' gravity affecting you more than the gravity of a planet" not withstanding, poor Carl (who I loved and respected) missed the relevant mechanism. I assure you that your nurse had nothing like the effect of 200 GIGAWATTS of Solar wind on you no matter how electrifying she may have been. Unfortunately so many seismologists have no knowledge of astronomy or space solar electrical phenomenon that they have no way to know how little they know. There are many intricacies of solar wind - for example the polarity of the solar wind changes every 28 days. The Sun's polarized solar wind would look like spokes of a wheel if you could see it. I would propose the moon's orbit settled the way it did to synchronize with the changing polarity of the sun's solar wind because when it was non synchronous the forces on the congealing moon mass would nudge it in the right direction. According to none other than a sitting Secretary of Defense Cohen in 1997 in a speech you can check yourself on the Defense Department's Website he claimed people were working on weapons "whereby they can alter the climate, set off earthquakes, volcanoes remotely through the use of electromagnetic waves." the official Department of Defense website. It's pretty fascinating. Here is the relevant portion of the question and answer period in its completeness. Answers are by Defense Secretary Cohen himself. More completely see his response to the question. deal with that (inaudible), at B'nai Brith. Woolsey here to perhaps even address this question about phantom moles. through the use of electromagnetic waves. People speculated about the Alaska HAARP research facility for years . It is now mothballed but for many years through 2013 HAARP provided live Induction Magnetometer feeds which this site used to link with. Those devices picked up tiny variations in the earth's magnetic field and even broke them down by frequency. HAARP itself was a large directional antenna array capable of directing beams of radio waves into the stratosphere of earth and possibly by reflection into the ground halfway around the world. 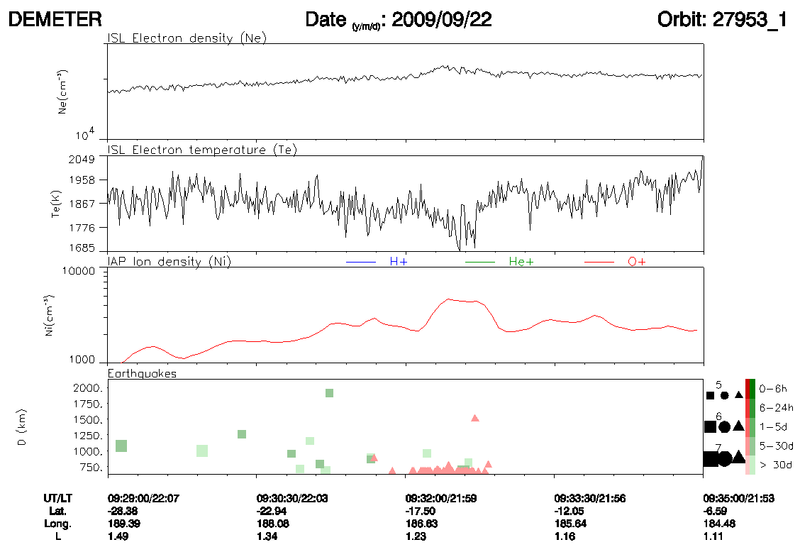 Here you see a live capture of the Induction Magnetometer feed around the time of the 2011 earthquake in Japan. As many people often noticed, earthquakes were often preceded by spikes in the 2.5 hertz frequency and you can clearly see such a spike here as well labeled "HAARP" with a red arrow. If you look at the HAARP spectrogram, you can see the moment when the earthquake occurred at the vertical red line, and what happened before and after. In the spectrogram you can see the emissions with constant frequency at 2.5 hertz, registered by the magnetometer. The signal frequency of 2.5 hertz is the evidence to many people that the earthquake was induced. In this spectrogram, the 2.5 hertz signal was registered before, during and after an earthquake. What is unknown, however, is the source of the 2.5 hertz spike. Many speculated that HAARP itself might be able to generate such a spike and even induce earthquakes in other parts of the world. That would not seem so far fetched considering Defense Secretary Cohen's 1997 Speech about countries developing earthquake weapons "through the use of electromagnetic waves" that we quoted above. I first became aware of the fascinating interactions of the Sun with the earth by a book called the Jupiter Effect published in the 1970's. 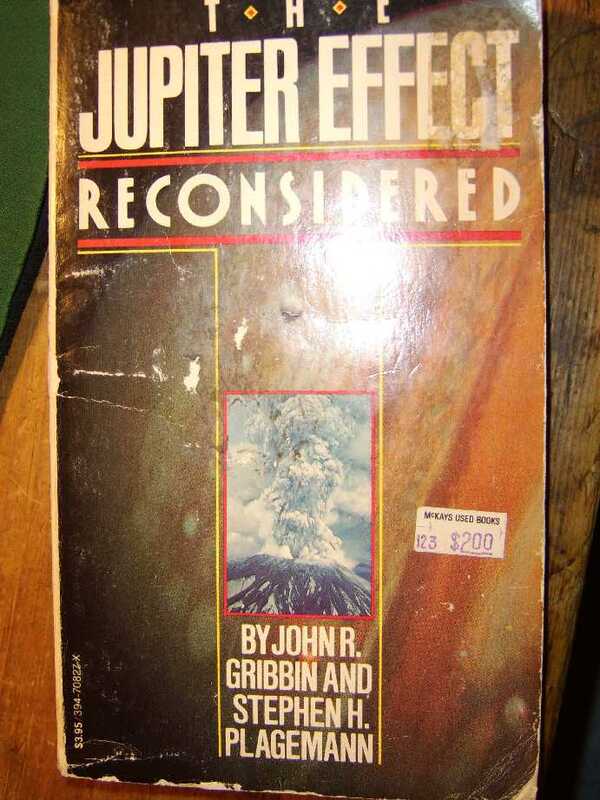 Many people (who haven't read the book) wrongly say this book predicted a big California earthquake when instead it simply said the odds of an earthquake were higher when the planets lined up a certain way and caused the sun to have more activity. This book documented many of the interrelated effects using scientific publications listed in it's bibliography which I reproduce here. 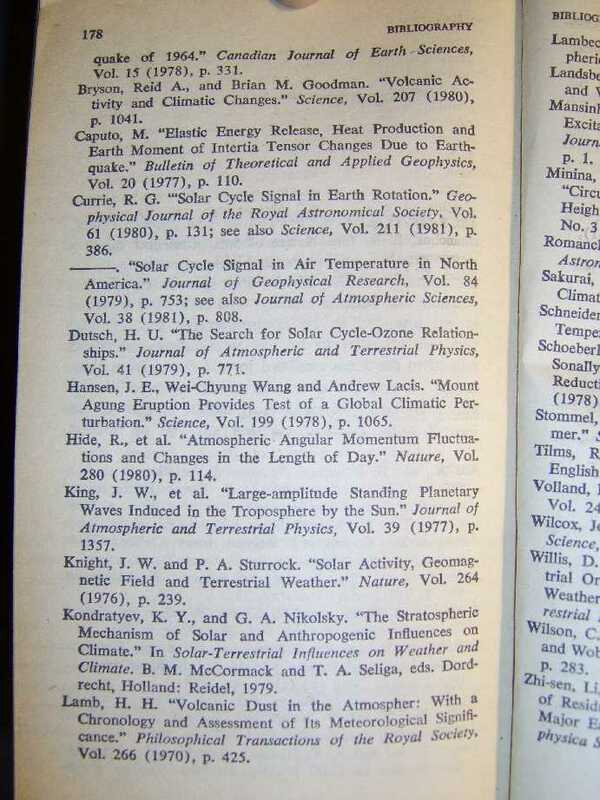 The book was the first book I am aware of which made scientific links to phenomenon such as planetary positions, Solar variations, the earth's spin and weather patterns and earthquake triggers. Prior to reading it, if anyone had mentioned the position of the planets affecting anything on Earth I and anyone else would have laughed it off as astrology nonsense. ( Carl Sagan famously said the gravity of the nurse at your birth bedside was stronger than the gravity of any of the planets.) However the author showed clear evidence of such links and gave new and novel scientific explanations of their possible mechanisms. The most interesting point he made was that the planet's positions affected the sun which was a quivering mass of high energy that was easily perturbed by the drastically changing center of gravity of the solar system when Jupiter moved around in it's orbit. The variations in the sun then affected the earth which no one denies. Another interesting point he made was that the sun could affect the speed of the earth's rotation slightly by changing its air mass arrangement. the variation was slight but it might be enough to jolt earthquake faults which were nearly ready to break into a full blown earthquake anyway. It would be A bit like the straw that broke the heavily loaded camel's back. In other words the quakes and volcanoes would react more during these periods of increased stress at a particular period of time related to the induced solar variations caused by the planet's particular positions. All and all it was an amazing piece of original scientific conjecture and logic. The author apparently got a LOT of academic heat for writing the book and has apparently retracted his support of the book to some degree. But that was after writing two sequels saying they correctly predicted increasing earth geologic activity which occured during the time period in question. Regardless of his public support for the book now, the book was well documented with copius peer reviewed papers of other scientists which he listed in the bibliography which documented many of the individual effects he discussed. Those peer reviewed papers of other scientists have never been challenged. The book "The Jupiter Effect", its successor "The Jupiter Effect Reconsidered" and the latest reprint edition "Beyond The Jupiter Effect" are out of print but can now be purchased used from Amazon for less than $2. Although Amazon rarely has a cover photo, you can see the cover of my personal copy in the last photo below. I highly recommend these books. They provide a wealth of research existing before the internet and provoke you to look at the solar system as far more than bodies of gravity in dull disconnected orbits around each other as most of us were taught. There is indeed now a huge body of evidence that the solar activity connects the solar system bodies in ways we never imagined. One of my goals in creating this website was to directly tap many of the new satellite and data feeds that become publicly available for the first time with the creation of the internet. By showing that those scientific feeds existed from reputable scientific organizations like NASA and that indeed those data changed drastically, I hoped to show that the earth exists in a highly volatile environment in space which can and does hugely vary the energy inputs affecting earth. By making those variations visible to everyone I hope to open minds to possible mechanisms by which many external forces affect the Earth and life on Earth. When this site was first created in 2000 or so, the earthquake experts at Caltech and elsewhere insisted earthquakes were completley random. Most damagingly they ridiculed and discouraged others who had evidence they were not random. The Former Experts at Caltech have since been proven wrong over and over. Connections have been made between distant earthquakes such as Landers and distant geysers (which Caltech rigourously said were coincidences at the time), electric activity preceeding earthquakes, measured stresses and daily variations in the earth's crust, variations in the positions of the moon - particulary large declinations, peizoelectric activity and even early warning devices operating in many different ways in places such as Japan. I have continually added some links to many of those papers that have been written since this website came into being although tere are many many more than I have linked. When this website was created Geologists insisted earthquake prediction would never be possible in anyway that would help people. Now Japan has early warning alarms and those same geologists now openly speak of Earthquake "Forecasting" (guess they can't admit they were worng about "prediction"). Indeed the former center of earthquake prediction denial in CalTech in the 1990's now openly seeks about $70 million dollars from the state of California to implement a network of sensors to give people in earthquake areas extremely specific short term time warnings about when the energy of an earthquake's S wave will hit within the minute after an earthquake has begun on a fault some distance away. Meanwhile right on this webpage you can buy a $29 device (see top sidebar) that will essentially do the same thing in a very similar way by detecting the P Wave hitting your home seconds or even minutes before the S wave arrives to collapse your house. This website continues to exist in the hopes it will possibly continue to encourage people to think outside the box and not ridicule novel ideas in science even when at first those ideas may seem far fetched - even ridiculous. I, in particular, often look more closely now at long held beliefs by older civilizations because there is no reason to believe older civilizations were less logical than we are. Therefore, if they held a widespread belief we do not understand, it is likely that we are misinterpreting their belief rather than they continued holding a nonworking illogical belief for centuries. Ancient civilizations precisely calculated seasons and calenders via they stars because their lives depended on it. If they did it they must have had good reason. The bibliography pages from The Jupiter Effect Reconsidered are reproduced below. They provide other excellent peer reviewed journal articles which are discussed in "The Jupiter Effect" books. "The Man Who Predicts Earthquakes" is also an excellent read. And don't forget to learn how to prepare yourself for circumstances where the luxuries of society may not be available for a time whether or not you live in an earthqyaje or extreme weather or fire zone. Your purchases help support this website which is not supported by any government or institutional funds. 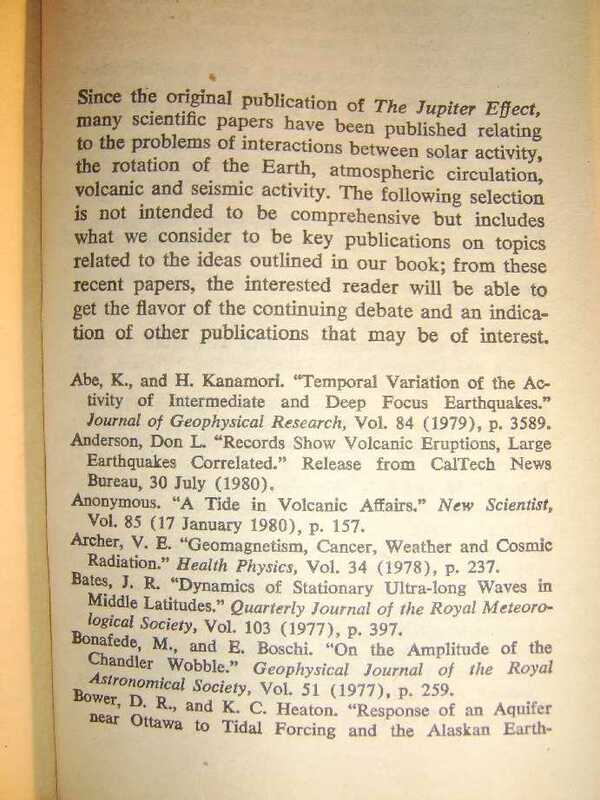 Peer Scientific References from Bibliography of 1980's books "The Jupiter Effect"
Email us with your thoughts. We never Spam. Obviously the sun has become tremendously active in the last three months and we have had major earthquakes during that time including the devastating 8.8 earthquake in Chile as well as the Haiti earthquake and a lot of activity in Southern California and Mexico. We corrected a few old data links. We have just added live twitter tracking of the term "earthquake." We have also completely the first ever study of possible correlations of the mentions of strange animal behaviour on Twitter as a possible precursor of earthquakes! (This has also necessitated the removal of two redundant solar imaging feeds to increase total page load speed.) Recently with the public awareness that Italian Seismologist, Gioacchino Giuliani, successfully predicted the April 2009 earthquake in Italy, many more people have taken interest in possible precursors of earthquakes. Mr. Giuliani used radon measurements which we will add when we can find them! As a result we have undertaken the most comprehensive rewrite of this page to make explanations more clear to amateurs interested in the possibilities of predicting earthquakes and saving lives. I never personally recommend products, but I am making an exception. I have found, tested and I USE in my own home a special $29 advanced warning seismograph alarm (earthquake detector) that is of great value to anyone living in an earthquake zone (like California, Oklahoma, or Japan). It can give you many seconds advance warning before you are really shaken hard by an earthquake or an aftershock with an epicenter several miles away because it detects the slight early vibrations of the P Wave which travels faster than the S wave which shakes everything. - a small smoke detector styled and sized device that attaches to a wall simply with velcro tape and runs on a 9 volt battery that lasts for months. This Earthquake Alarm can give you extra seconds of advanced warning BY SOUNDING A LOUD ALARM before you are shaken by a strong quake . 10, 20 or 30 seconds warning can really make a huge difference by allowing you to be prepared to feel the motion and securing yourself, property, loved ones or just grabbing your clothes and shoes before the strong swaying motion starts. It works by detecting the very slight P-wave which travels faster than the destructive S-wave which, like a distant lighting flash preceeds thunder, can give you many seconds before you are really shaken by an earthquake with an epicenter a few miles away. In this way it can act like an earthquake warning system if the earthquake or aftershock is rolling towards you from a few miles away. This can REALLY give you a lot of peace of mind because everyone who has lived through one knows it is the complete lack of warning of most earthquakes that is the most unsettling. This device will chime before you feel any large earthquake that does not originate right under you. Think of it as a warning like the flash before thunder - if the lighting is a few miles away the flash gives you warning before the thunder hits you. If the lighting strikes right were you are you won't obviously get any warning but MOST EARTHQUAKES THAT AFFECT YOU START A FEW MILES AWAY. I have been using one since April 2010, and it has sounded an alarm about 20-30 seconds before EVERY quake over 4.0 near Mexico that later shook me in Los Angeles. It wakes me up if I am sleeping too. I now sleep better knowing I will be woken up before most shaking earthquakes are felt. I CANNOT RECOMMEND IT ENOUGH. For $29 you should just GET ONE. (If you can't see the picture because you run adblock then copy and paste this text http://www.amazon.com/dp/B001D8NMY4/ref=as_sl_pd_tf_lc?tag=electricquakes-20 into a new tab to see it on Amazon. ) A few extra seconds to wake up and get out of bed or get off a ladder or grab your pet and get out the door or cover your children's heads makes all the difference! As a test count to 20 now. It's a lot of TIME! The alarm routinely gives me that much warning before the shaking starts from earthquakes on faults near Los Angeles,CA. I make almost nothing from the sale of these (About $1 from Amazon). I don't own the product or company. That isn't why I am recommending them. They give you possibly life saving warning and give you some peace of mind when sleeping. It's also cool for amateur seismologists and children because you can make it VERY sensitive to any earth motion if you turn the sensitivity way up so your kids can learn about science and seismology. Again I highly recommend them. It is a remarkable device for those living in fear of earthquakes and aftershocks. 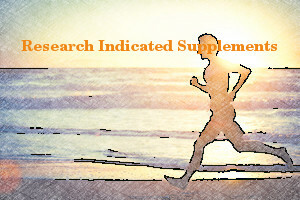 *Email this page location to a friend or skeptic! ElectricQuakes, The Global Boil and GlobalBoiling and Supercanes are original terms created by and trademarks of the owner. All rights are reserved.